In Episode 6, Joe Murphy, Q.C. and Joe Battista, Q.C., discuss their extensive personal injury law experience and the firm’s focus on complex claims including medical malpractice and brain injury cases. 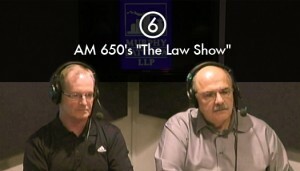 The founders of the firm reviewed topics including the importance of Underinsured Motorist Protection, the fiduciary duty that lawyers owe their clients, as well as explaining the options available where clients (either very young or cognitively impaired due to injury or a disease like dementia) cannot provide instructions to a lawyer. Both of them stressed the importance of finding a lawyer with sufficient experience to take your case, particularly in complex areas like medical malpractice. They also cautioned clients to confirm whether the lawyer they are thinking of hiring acts both for and against ICBC and what that means in terms of how that firm is obliged to act towards ICBC. With “plaintiff only” firms there is never any question of loyalty. Finally, they suggested asking the lawyer how often they go to court and confirm it by asking for the names of recent cases where the lawyer has gone to trial. While more than 99% of personal injury cases are settled, the settlement can only be maximized if ICBC knows that your lawyer is ready, willing and able to go to trial. In the next segment, Stirling Faux asked them to review the importance of Underinsured Motorist Protection (UMP). A key takeaway is that UMP is a critical part of protecting yourself and your family from the financial impact of a serious car accident both in Canada and in the US where the responsible driver has little or no insurance coverage. UMP provides a guarantee of the insurance money available if you or your family member is injured. The basic UMP sold by ICBC to everyone is $1 million, and for $25/year, you can increase this guarantee to $2 million. Some homeowner policies allow you to purchase more than $2 million in UMP coverage. UMP is valuable coverage for everyone, but especially for those who sometimes travel to the US and for families with teenaged children. Next Stirling Faux asked them about the meaning of fiduciary duty and whether, in their experience, it was ok to deal with ICBC directly when it came to settlement offers. They explained that a fiduciary duty arises out of a special relationship where one party is vulnerable and dependent on the other party to exercise their judgment and act in the dependent party’s best interests. In this situation, the vulnerable party is the injured client who is depending on their lawyer to provide sound legal advice and appropriate representation to obtain the best possible recovery. This may include advising the client when a settlement offered is substantially less than what could be recovered at a trial. The client depends on the lawyer for skilled advice, and should be entitled to expect that – and nothing less – and that is why it is important to choose a lawyer who is ready, willing and able to take a case to trial – if needed. An experienced lawyer will weigh the facts of your case against the prevailing law and advise you of your prospects of success; while almost all cases are settled, the settlement should be based on the prospects of going to trial. Your lawyer has a duty to act in your best interests and they should explain the pros and cons of different options to you. If going to court is not in your best interests they should recommend settlement but in every case they should provide you with the facts you need to make an informed decision. Wait Until you Have Made a Full Recovery or you Have Plateaued. Another key take away was that if you have been seriously injured, you should not start contemplating settlement offers until you have made a full recovery or you have plateaued in your recovery, meaning you are not likely to get any better. Full recovery occurs only if you are able to go back to all your normal activities without restriction. Medical evidence is very important, but you are the best judge of how you are doing. Once it’s clear you have recovered or plateaued, it is essential that you understand what will or may happen in the future. Joe Murphy gave the example of a fracture that extends into a joint and the likelihood of whether that will cause arthritis years later. At Murphy Battista LLP, our lawyers often provide second opinions on settlement offers – and there are cases where injured people should get a second opinion before settling their case. In the final segment of the show, Joe Murphy, Q.C. and Joe Battista, Q.C. discussed the options available for handling cases where an injured client cannot provide instructions to a lawyer because they are very young (a minor – under 19) or incapacitated due to brain injury or a cognitive impairment like dementia. These options range from powers of attorney, representation agreements and committeeships and in the case of young (infant) claimants involves an adult acting as a litigation guardian for the child. If you have a personal injury law issue related to any of the subjects covered in “You and the Law,” Episode 6 we invite you to call the firm and speak to one of our lawyers. Initial consultations are always free and we encourage personal injury victims to get advice before making decisions and taking actions that can affect their rights and their futures.